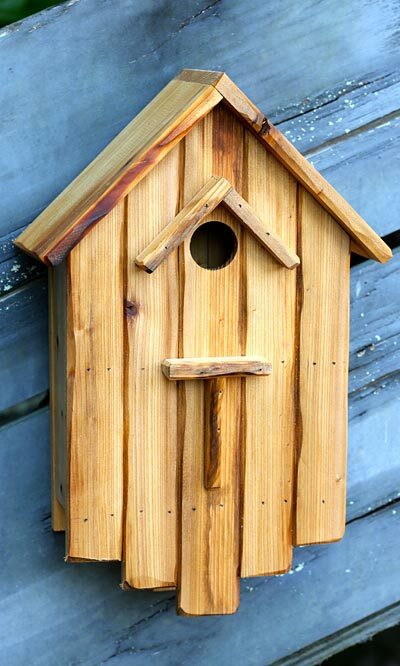 Bring a classic tale to life in your bird garden with the Heartwood Huck's Hideaway Bird House. This wooden shelter evokes the simplicity of Huckleberry Finn's cabin, with its slatted front panel and soft brown color. Made from cypress reclaimed from a 19th century building, this shelter highlights both literature and history. A pitched, wooden roof creates a familiar shape on the unit, and a matching ridge above the 1.5" diameter entry adds a unified look to the piece. The slats also increase in size toward the center of the house, creating a slightly pointed edge for even more style, and a landing perch completes the unit. Wrens, chickadees, or bluebirds can easily enter the home through the opening, and the overhanging roof line helps the interior remain dry. The base offers plenty of room for a nest, and drainage here helps any excess water escape. The flat back and included hanger make it simple to place this home against a post, fence, or wall, and a cleanout panel here allows for seasonal maintenance. The reclaimed cypress construction is sure to last for many seasons, and the tan tone enhances your garden easily. Help your feathered friends appreciate classic literature by placing this Huck's Hideaway Bird House in your yard. Made in the USA. Erva Post Mounted Tall Squirrel Baffle, Tan, 8" dia.